Based on an obscure Japanese MSX release, Castlevania Chronicles is definitely one of the more interesting and enjoyable titles for the Playstation and Castlevania collector. While it's extremely rare to find one of these at a good price these in the wild or online days, the game is definitely worth seeking out. It definitely has that classic Castlevania feel about it, so join us as we open our archives and take a look at this under-rated Belmont adventure. It's definitely one of the most under-rated games in the series and should be a prime candidate for inclusion on one of the current consoles' download services. Anyone that played the series’ dismal 3D offerings in recent years will tell you that the classic Castlevania series has always been at its best when it takes place in 2D. In fact the most successful recent installments in the series have been the Game Boy Advance titles like Aria of Sorrow and Circle of the Moon plus Symphony of the Night on the original Playstation. The more recent DS installments have further cemented this theory amongst gamers, especially now with the excellent releases Curse of Darkness and Portrait of Ruin. The brilliant gameplay and masterful artwork featured in these two games have proven this perception to be correct. Given the success of those two titles, it’s no surprise that Konami has decided to release a port of the Japanese title Akumajo Dracula for the Playstation domestically as Castlevania Chronicles, a bargain title that’s actually worth the money you pay for it. The cool thing about Castlevania Chronicles is that this game has never been released stateside in any form, appearing only on an obscure Japanese computer console, so this is doubly good news for both gamers and collectors. Its conversion makes sense at this point in the PS1’s lifecycles and true hard-core fans should be delighted by this title’s appearance, especially with all the classic, timeless gameplay it offers. However, it most be noted that Castlevania Chronicles isn’t a straight port as Konami has placed a few extras to add value to the package and has even included some really exciting enhancements in the original. These include an art-gallery which is quite impressive and an interesting interview with the designer of the legendary Symphony of the Night and the upgrades in this package. The title’s strongest element is the new arrange mode, which includes slightly better graphics that are more in keeping with the most recent installments. The most notable change comes about with redrawn sprites for the main character and Dracula himself. There are also some enhanced lighting effects and a much improved music score which is quite elaborate. You can also select which type of music you want to use, just in case you find the original 8-bit music more authentic. The odd thing about this is that CC is actually easier in the arrange mode as well which is annoying but still, the extra eye-candy is worth it to some degree. The new graphics are impressive, though to be honest, the game plays identically in each mode, and as such the changes are strictly cosmetic. Which mode you prefer boils down to personal preference and depends on whether you want to play this classic Castlevania adventure in its purest form or like the new effects enough to play it again in that mode. Either way, this is a fantastic title. While the graphics have been enhanced, thankfully, little else has. Those looking for an elaborate, deep platformer with multiple-branching levels in the vein of recent Castlevania releases are going to be disappointed by this title. The gameplay is relatively simple and seem a tad short, with eight strictly linear areas divided into three stages each, making this a relatively short adventure, by today’s standards. As usual, boss enemies appear at the end of each stage which means that the game follows the standard formula with no divergences. 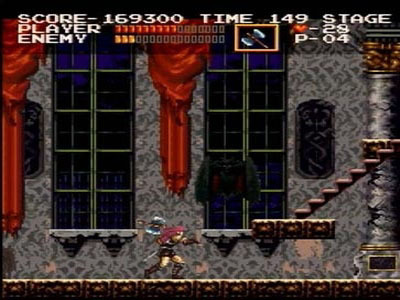 The usual cast of Castlevania enemies such as the zombies, the demonic heads and of course Dracula himself make appearances in this edition, and for the most part, the react and attack as they always have. This gives it a real sense of familiarity and grounds CC firmly within the Castlevania canon. You can definitely see the pedigree of the series in action here as the classic, timeless gaming makes this a cool retro flashback for older gamers. As you’d expect, the controls are tight and responsive, as expected making for a surprisingly easy adventure. What’s more, the level designs and layouts are also quite familiar which makes playing this akin to slipping on an old, yet comfortable old shoe. It’s not entirely predictable, but players should be familiar with these levels. These are basically variations of the layouts and boards seen in Castlevania’s original games. Some small surprises appear in this edition, so don’t go on auto-pilot. Likewise, the special attacks and power-ups should be familiar as well. Classic CV items such as the holy water, time pieces and boomerangs making return appearances, as does the eternal vampire hunter’s friend, the whip. You can upgrade the whip and collects hearts to use the special attacks. While it’s a definite retro flashback, that doesn’t mean the game is easy. It’s a good, solid title with none of the bells and whistles of today’s games. The downside of this is that it feels extremely dated even with the updgrades. This is only reinforced by Castlevania Chronicles’ rather drab color schemes, predictable gameplay, primitive animation and simple play mechanics. While the new upgrades make the game’s look much better, they can’t entirely hide the game’s age. There’s little in the way of extras offered, with only a time-attack mode offered as a bonus when players complete the game. It’s basically a retro pack so you should know what you’re getting into ahead of time. That said, classic game fans will love the title, as should anyone else who’s played video games for the past 15 years. While CC doesn’t offer much in the way that is new, players who grew up on the series will love playing this "lost adventure". This is definitely one of the more interesting and enjoyable titles for the Playstation and Castlevania collector. While it's extremely rare to find one of these at a good price these days, the game is definitely worth seeking out.